Is this Burn? I don’t know. In any case, Torment of Hailfire seems like it’s not very good. However, in a right shell it might work quite well. Last weekend I played a PPTQ. I didn’t do well, but whatever. I think my deck choice was pretty good. I just wasn’t playing optimally myself. However, what I wanted to talk about was Saheeli Rai. Remember Treasure Cruise? This isn’t quite that. 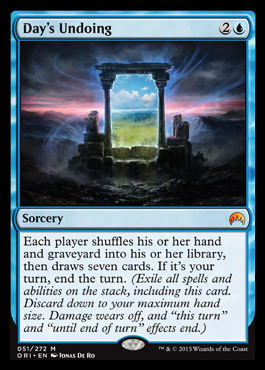 You have to actually pay two for the effect..
Not sure how you feel about this card, but after the obvious ones (“do they really need to redo the power 9”), my throughts were “this is going to be the source of so many judge calls” and “wow, burn”. Plenty of players would like to continue to play their favorite decks from the past. Although many of the big ones will be effectively dead or completely reworked (see previous installments, especially part 5), its worthwhile to take a look at some of them and see what can be done.